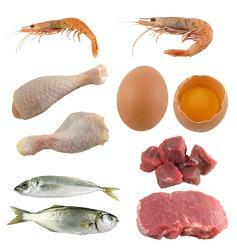 Proteins - Enlightened Solutions Ltd. - Paleo Nutrition - Designed By Nature. It's necessary for repair and growth of skin, hair, muscles, tendons. and well, everything in your body. You need it to recover from exercise, to make antibodies against disease as well as hormones and enzymes. It's pretty important, and a requirement for life. Severe protein deficiency is common in third world countries due to the lack of food and nourishment. As an aside, food donations to these countries is usually in the form of grains. This should give you cause for pause and thought. But, people in more developed nations people may suffer from a deficiency of proteins, tho' not very serious, due to the overconsumption of junk and processed foods that are loaded with carbs, sugars and unhealthy fats (see our "Fats" page for details). Kwashiorkor is a disease caused specifically by a lack of protein in the diet. Marasmus is a wasting away of body tissue from a lack of both calories and protein in the diet. As with most deficiencies, children show symptoms earlier than adults. Adequate protein is also essential for weight loss and body re-compositioning (that is, losing more fat than muscle while dieting). It may increase metabolism and produces satiety due to it's dense nutrition. The amount of protein needed can differ from person to person, and while protein has not been shown to be harmful to healthy kidneys, people who are at risk or those with pre-existing kidney issues should discuss their protein intake with their doctor. Try to avoid products that come from CAFOs (Concentrated Animal Feeding Operations, also called "feedlots") whenever possible. Not only are the animals kept in highly stressful, filthy environments and fed inappropriate diets. These conditions make for products that are less nutrient rich and more prone to illness (and the subsequent medications) and contamination than their naturally reared and fed peers.